to the Polish, Russian, Jewish and other Eastern European peoples who suffered, endured, and contributed so much to Allied Victory over Nazi Germany and its Axis partners. and to the Red Army and people of Moscow, who handed Nazi Germany its first decisive defeat on land in the Second World War. There is also a MOSCOW DEFENDED! thread about the game on John Kranz's Talk.ConSimWorld wargaming forum. Look under Boardgaming/Individual Game or Series Discussion/Individual Games. You will want to print these off as large as possible and then enlarge the map with a photocopier after that, so that the mapboard comes out to a width of about 11"/28cms. Cream is an excellent map color. The transportation lines are roads. Railroads are implicit in the game system. The Russian 4. 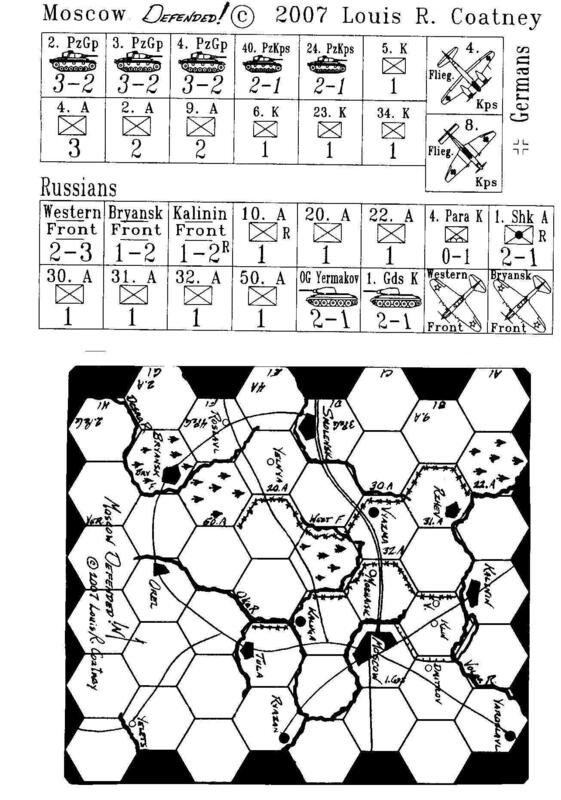 Parachute Korps starts the game in Kaluga. I have now changed Western Front to a 2-3 instead of a 1-2. Unit log (with starting positions)-- Under Construction in .htm/Web format. Or would you rather play my longer, more detailed game of this crucial World War 2 battle, Moscow Attacked!? Another free, Battle of Moscow game is at the "www.Grognard.com" website. It is designed by the award winning designer, Frank Chadwick, and reflects his own interpretation of the battle. I'd urge you try Frank's game too, to see how two different designers can each model the battle in his own way. Now would you like to go back to my home page to see/print off the other games and/or cardstock model warships I have designed? ... or e-mail me at ELCOAT@Hotmail.com. You may also telephone me at (309)836-1447. You can leave a message and/or your mailing address on my recording machine if I don't answer; but I cannot afford to return calls.